According to the 1951 Geneva Convention relating to the Status of Refugees, a refugee is a person who is outside their country of origin, have a fear based around reasons of race, religion, nationality, political opinion or membership in a particular social group, and because of this fear, they cannot or are unwilling to return to their country. The United Nations High Commission for Refugees (UNHCR) estimates that at the end of February this year, about 152,570 refugees and asylum seekers are in Malaysia. They include about 141,570 from Myanmar, 3970 from Sri Lanka, 1200 from Pakistan, 1100 from Somalia, 960 from Syria, 850 from Iraq, 550 from Iran, 430 from Palestine and others. What made me interested in doing this project is that I want to know about their lives deeper, by knowing what valuable and memorable items they have brought with them during the journey to Malaysia to seek refuge. The main challenge I faced was how to get closer to them. I needed to spend time with them so that they will feel comfortable with me and share their lives and begin to show their belongings to me. Another challenge is to identify the location of their settlements and the limited communication is a bit complicated to progress my project. Adi Safri is a photographer based in Kuala Lumpur, Malaysia. He studied Photography at a local University before beginning at a local newspaper and production house. He has covered a range of stories on Malaysian festivals and events. He works at The New Straits Times Press as an entertainment photographer. Somali women, Filsan Jama Muse holding her son. During her escape, she was pregnant with this son and give birth in Malaysia. Laila Amiruddin, 17 years old, ethnic Rohingya, Myanmar with her school bag. Osman Bilal, 31 years old, ethnic of Rakhine, Myanmar, with his engagement picture (second from right is his fiancee). His fiancee now living in Myanmar. Tawhidah Mohd Ghafar, 18 years old, ethnic Rakhine, Myanmar, holding a plate of Thanaka (a traditional herb talc) that she brought from Myanmar was for the use of the whole family before she came to Malaysia. Abdul Basik, 18 years old, with his slingshot. This is his favorite slingshot which he brought from Myanmar. Osman Mohamad, 37 years old, ethnic of Rohingya, holding a Hadith book ( a collection of texts purporting to quote what the Islamic prophet Muhammad said verbatim on any matter). This book he bought from Myanmar and is always with him. Mohd Ghafar Malik, 39 years old, ethnic of Rakhine, Myanmar, holding a picture of his kids. One of his sons is now in Myanmar and taken care by his aunt. Mohamad Haniff Hussain, Ethnic of Rakhine, Myanmar hold his last 200 Kyat note when he arrived in Malaysia. Somali boy, Bishar Abdisalam, 12, holding his shoes given to him by his father. Until now his father is believed to be lost due to war. A Somali boy, Ali Abdisalam, 15 years old, wearing ‘Goa Shall’, a traditional Somali cloth. This cloth was giving to him by his father. Until now his father is believed to be lost due to war. A Somali child, Khafid Ahmed Khaif, 4 years old holding a toy that was taken by her mother during the escape to Malaysia. This toy is the only thing he loved and brought here. 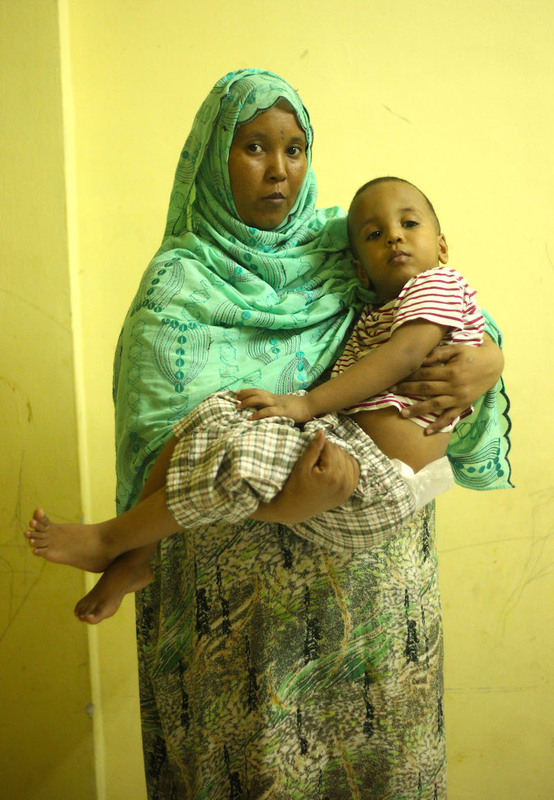 Somali women, Hawo Mohamed Abubakari, 32 years old, with her son, her only child. Shaban Amiruddin, 18 years old, ethnic of Rohingya, Myanmar with her slippers that she wore to escape to Malaysia. Adi is part of Exposure+5 and was mentored by Snow Ng.